Moyes is hoping he decides to remain on Wearside, with potential suitors already forming an orderly queue. However, the Scot has admitted his surprise that the club agreed to the clause when they signed him from Toronto in a deal worth around Â£6million in January 2015 during Gus Poyet's reign. Everybody at the club wants him to stay, all the supporters want him to stay, but it has to be Jermain's decision what he does. I would hope that in my time, if I had been the manager, I wouldn't have allowed a clause like that to be in there. "But it is, and obviously we have to honour the contract." 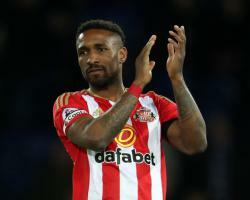 Defoe's 15 goals for the club this season have helped him win a return to the England squad, and he reminded manager Gareth Southgate of his enduring potency with a strike in a 2-0 World Cup qualifying victory over Lithuania in March. With next summer's finals now back on the agenda, Moyes admits his hopes of retaining the striker's services could be slim. He'll want to, I'm sure, push and try to be a member of the World Cup squad, and I think he'll be thinking, 'It's hard to do that if I'm a Championship player'." Moyes' own continued presence at the Stadium of Light remains a topic for debate after initial talks with owner Ellis Short were adjourned until the end of the season. I put in the plans of what I think it should be like and where it needs to go, and I'll meet Ellis at the end of the season and discuss it." However, if he does remain on board, the manager will be shopping for a specific type of player as he prepares to overhaul a squad which includes eight men who are out of contract, three loan signings, plus Defoe and goalkeeper Jordan Pickford, both of whom are attracting interest from elsewhere. He said: "We use the word 'robust' and we are talking about trying to get as many robust players as we possibly can." Meanwhile, Moyes declined to confirm whether or not he had admitted a Football Association charge over his "slap" comment to a female reporter after requesting a personal hearing. He said only: "It's a live case and whenever the case is, I'll meet them and speak to them about it."